On Saturday, January 3, onboard Oasis of the Seas, a four-year old male guest from Italy was rescued from one of the ship’s swimming pools. The guest was initially treated by the ship’s medical team, but required additional medical attention. Therefore, the ship altered its course and sailed back towards Port Everglades. Royal Caribbean’s Care Team is providing support to the guest’s family and our thoughts and prayers are with them. Oasis of the Seas is currently on a seven-night cruise that departed Port Everglades, Florida, on January 3 and includes port calls to Labadee, Haiti; Falmouth, Jamaica; and Cozumel, Mexico. The Miami based cruise line has also confirmed with us that the the boy was in the the H20 Zone when the incident happened. Previously we reported that he could have been in the the ships FlowRider but this is now not true. Latest reports are that he is still in a critical condition. A near tragic event occurred on the worlds largest class cruise ship where a young 4-year-old boy has almost drowned in the Oasis of the Seas deck 15 wave pool. According to reports the child was in the ships wave pool at around an hour after oasis of the Seas departed it’s homeport in Port Everglades at 4:30 pm 3rd January. The young child got swept underwater. The Sheriff’s Fire Rescue department have said that the boy may have been underwater for approximately 5 – 10 minutes. The 4-year-old was rescued from the pool by other passengers and immediately gave CPR until the ships medical crew arrived. The boy was then revived by the ships medical staff and given further emergency treatment. first knowledge of the incident was from the popular Port Everglades web cam and the tweets below announce the 225,300 gross ton ship was sailing back to the port in Fort Lauderdale for a medical emergency. 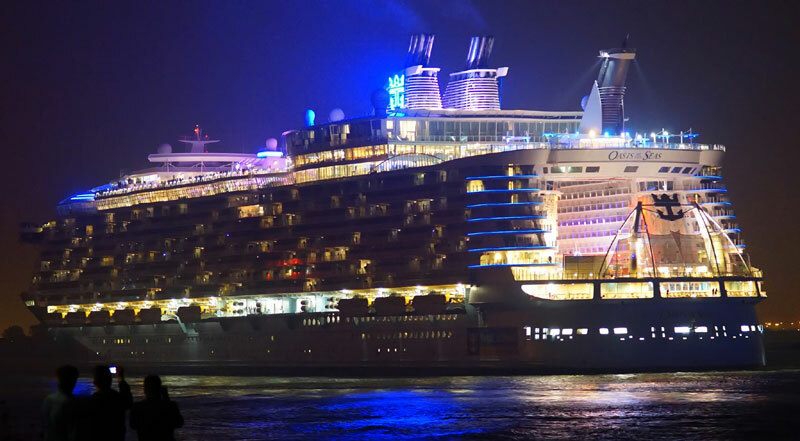 #OasisoftheSeas returning to #PortEverglades – reason not discussed over VHF. ETA 30 minutes. According to local news station 7News “A bystander noticed the child, alerted somebody that was in the pool that pulled the child out,” Jachles continued. “Bystanders began CPR. It was continued to the ship’s infirmary.” Once oasis of the Seas arrived back to port the boy was transferred to Broward Health medical center where he is in a critical condition. The young boy was cruising with his mother, father and sibling and are not from Florida. It’s not clear exactly what pool the boy was in but it could have been the FlowRider at the aft which is normally used just as a surfing simulator or he could have been in one of the larger pools on the open deck. After an investigation by local authorities the large cruise ship was able to depart Port Everglades at around 10:45 pm. Oasis of the Seas was just beginning a 7-night voyage around the Caribbean, no delay has been announced by the cruise line yet. Cruise Hive has contacted Royal Caribbean for further details and will update this report once more news is released on this developing story. Royal Caribbean Ltd has released renderings of a new 10-story development to its headquarters based in Miami, Florida, the cruise capital of the world. Royal Caribbean has taken delivery of Spectrum of the Seas, a new cruise ship and the first in the Quantum Ultra class. Royal Caribbean has closed the new SkyPad feature due to safety concerns. It is currently on three cruise ships including Spectrum of the Seas.